It was a mixed week for US equity indexes, with net weekly changes ranging from +1.8% (Nasdaq comp'), +0.6% (R2K), +0.2% (sp'500), +0.05% (Dow), to -0.3% (NYSE comp', Trans). Near term outlook offers moderate weakness, but broadly, the US market remains super strong. 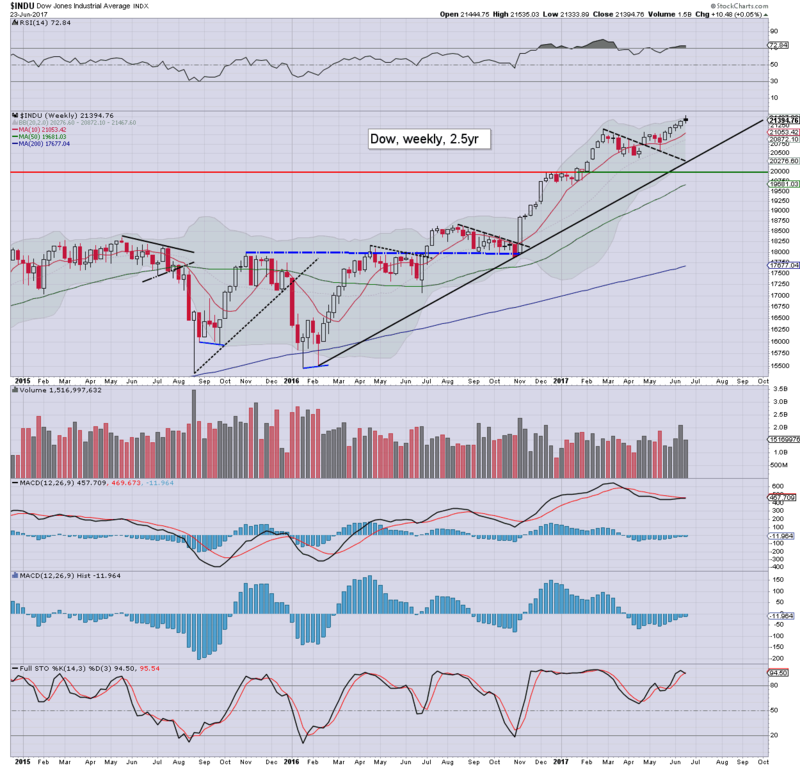 The sp'500 climbed for a second consecutive week, settling net higher by 5pts (0.2%) at 2438. There was a notable new historic high of 2453.82. Underlying MACD (blue bar histogram) is fractionally positive, indicative of underlying market strength. The key 10MA is at 2406, and will offer support within the 2410/15 zone into end month. Best guess: no sustained price action <2400 this summer. 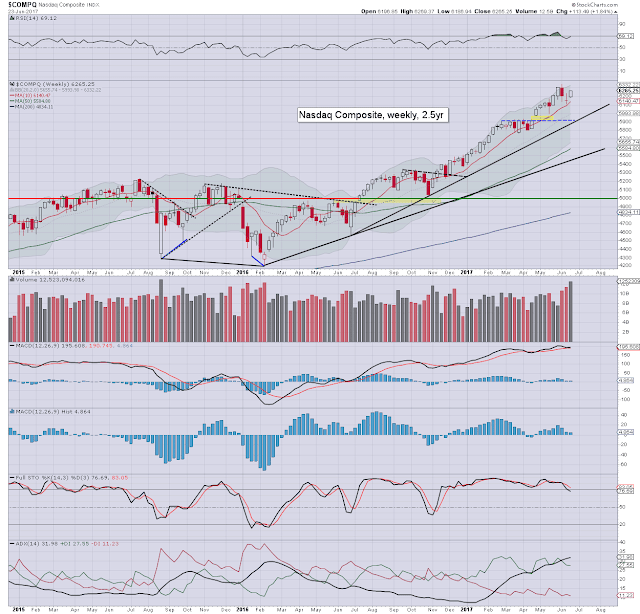 Technically, the 2500s will be viable as early as late July, but that will require almost everything to be Goldilocks. Equity bears will have their best chance of a 5% retrace in Sept'/Oct. The year end target of 2683 remains on track. Equity bears have nothing to tout unless a break of core rising trend - from Feb'2016 is broken. Right now that stands around 2270, and is climbing by around 25pts a month. 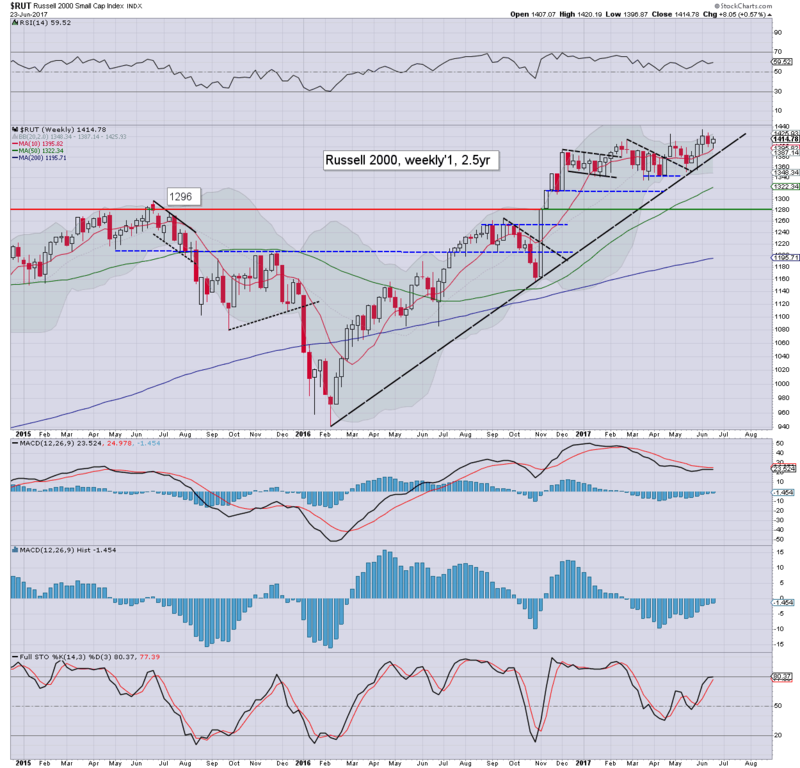 Within the 'delicate' period of Sept/Oct, things would turn exceptionally bearish on any daily close <2370. If that occurred, the first target would be the lower monthly bollinger.. currently around 1900. The Nasdaq continues to lead the way, settling higher by a rather significant 1.8% at 6265, which isn't that far below the recent high of 6341. Short term support is around 6100, and considering ongoing price action, the 6k threshold looks secure for the summer. The 7000s are highly probable before year end. The mighty Dow settled higher for a fifth consecutive week, but by just 10pts (0.05%), settling at 21394. There was a notable new historic high of 21535. Underlying MACD is set to turn positive within 1-2 weeks, as the upper bollinger will keep prices restrained to around 21500/600 into early July. The giant psy' level of 20k is powerful support, and should hold for the rest of the year. The master index settled -0.3% at 11733, but did notably break a new historic high of 11836. The mid term trend from Feb'2016 remains comfortably intact. Things only turn bullish if any price action <11500 in July or onward. The 12000s will be viable by late July/early August. 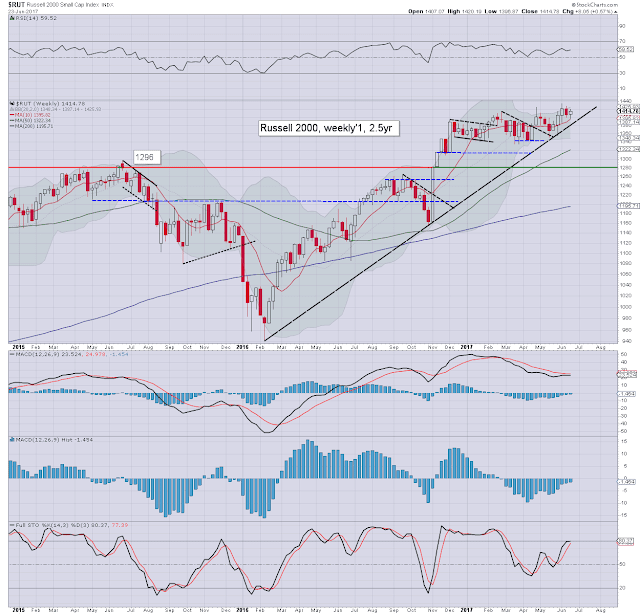 The second market leader - R2K, settled +0.6% at 1414, which is just 17pts shy of the recent high. Underlying MACD is set to turn positive within 1-2 weeks, and bodes for the 1420/30s. The 1500s are a realistic target by late September. Things only turn provisionally bearish if <1390, and that is admittedly not that far down. The 'old leader' - Transports, settled net lower by -0.3% at 9388. Underlying MACD is set to turn positive within 1-2 weeks. 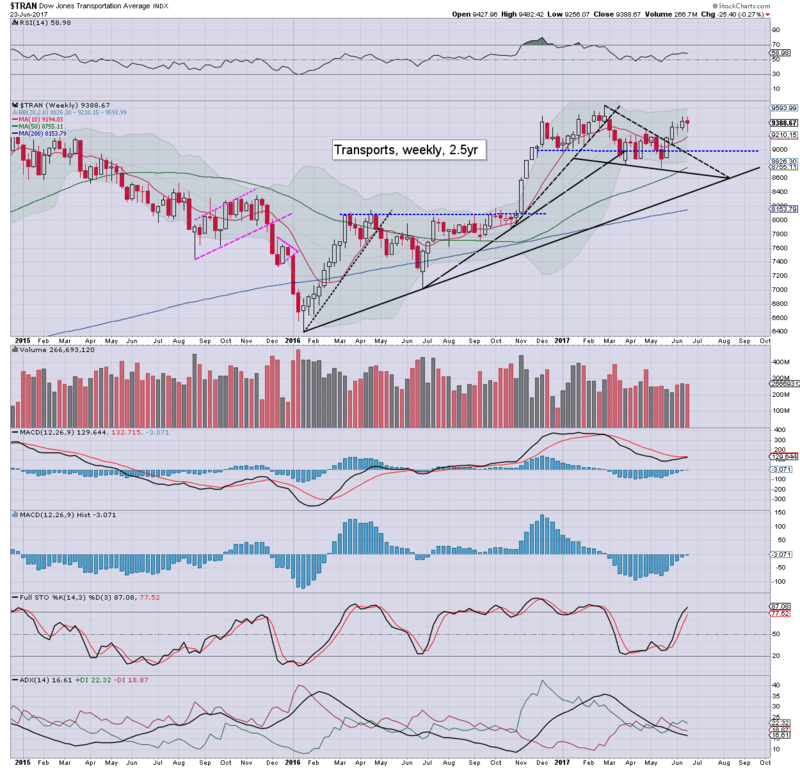 Low energy prices are especially bullish for the fuel consuming transportation stocks, and thus further upside to the giant 10k threshold seems probable this summer. Things only turn bearish with price action under the May low of 8744. Even then, core rising trend will offer support around 8600 in August. 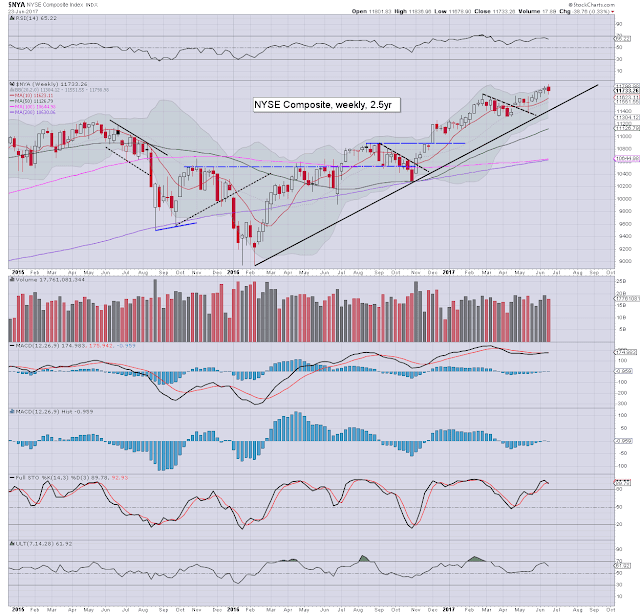 All the main US indexes are holding within their mid term bullish trends from early 2016. 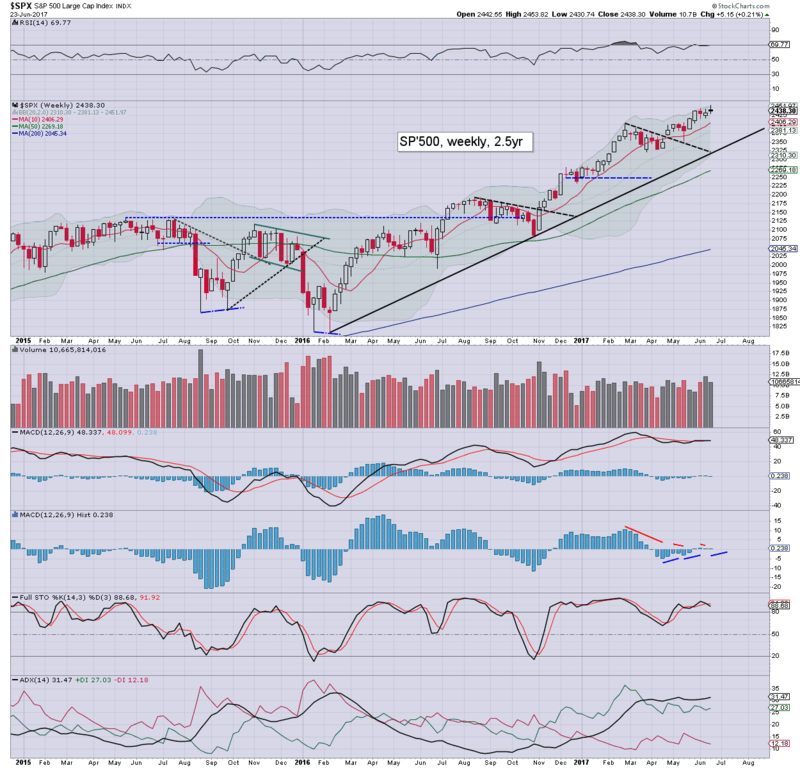 The laggards - Trans/R2K, are both close to breaking new historic highs. F - Pers' income/outlays, Chicago PMI, consumer sent'. *There are a handful of fed officials on the loose, notably, Bullard (Thurs, 1pm EST), who will be just a few miles away from yours truly in London, giving a lecture on the US economy and monetary policy. **Friday will be end month/Q2, and indeed.. the first half of 2017. There is high threat of an element of 'window dressing', which most certainly will favour the equity bulls. For $20pcm, I typically provide 200 posts a month (40,000 words a month), 500 charts (at minimum), covering everything from the equity indexes, VIX, oil, gold, silver, bonds, currencies, and a broad array of individual stocks. US equity indexes closed moderately higher, sp +3pts at 2438. The two leaders - Trans/R2K, both settled higher by around 0.7%. 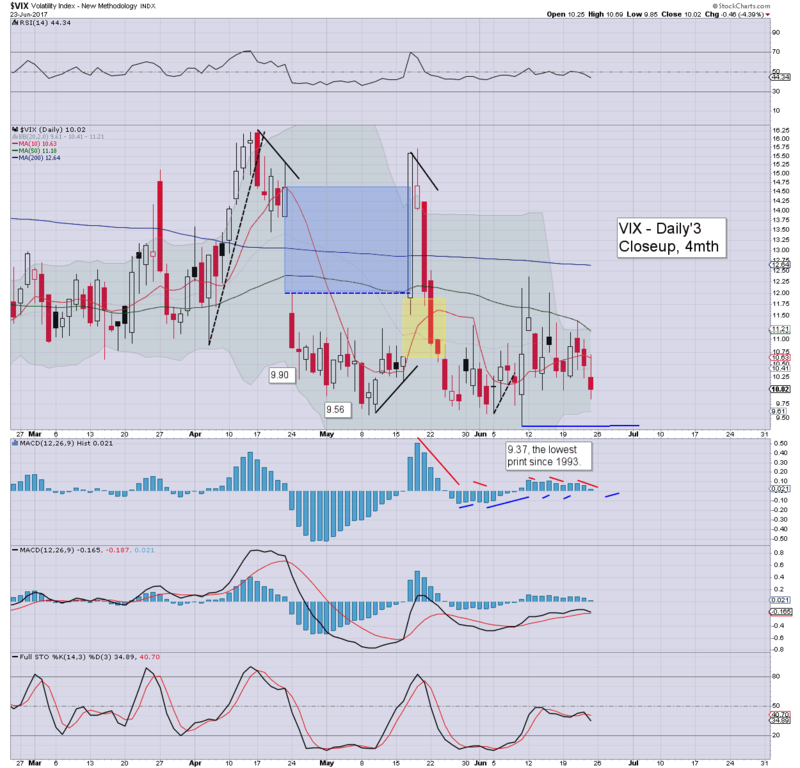 VIX settled -4.4% at 10.02. 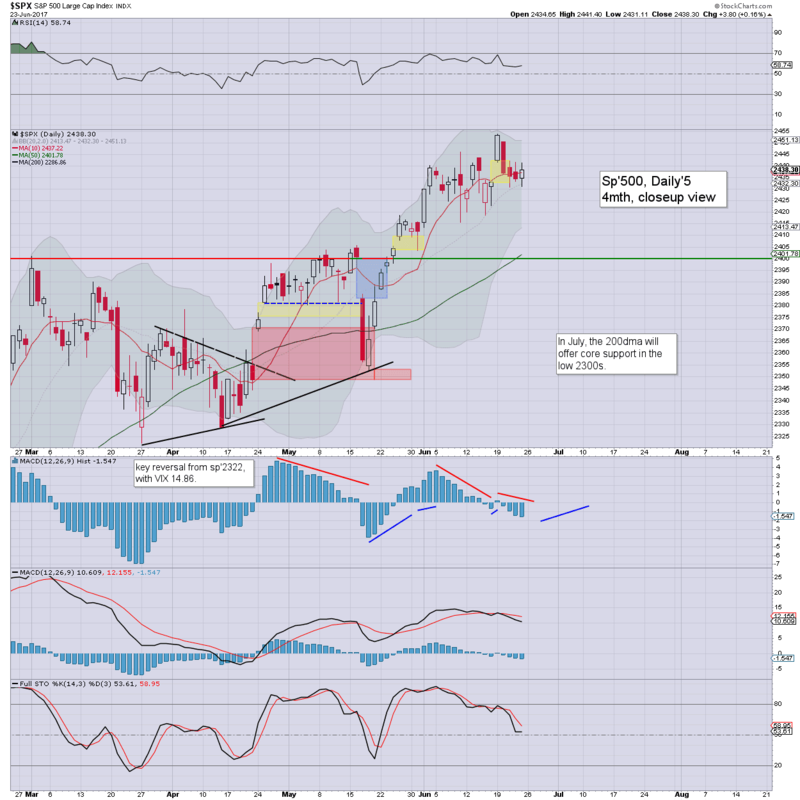 Near term outlook offers weakness to around sp'2415. More broadly, the 2500s are viable as early as late July. US equities opened in minor chop mode.. leaning a touch weak. The market hit sp'2431, and then it became apparent that some were already hitting the buy button. There was a moderate swing upward into the afternoon to 2441, before cooling to 2433, and then spiking upward into the re-balancing weekly close. Volatility remained subdued, and with an anticipated sleepy weekend ahead, the VIX even failed to stay out of the 9s... which was something of a surprise.